Radial velocity curve (top) and residuals (middle) of CoRoT-20 from FIES (orange), HARPS (purple) and SOPHIE (blue). Generalized Lomb-Scargle (GLS) periodogram (bottom) of the radial velocities after subtraction of the two orbits. False alarm probability levels are plotted for 50, 10 and 1 percent. Credit: Ray et al., 2018. An international group of astronomers has discovered a new substellar object in the planetary system CoRoT-20. The newly identified object was classified as a brown dwarf due to its mass, which is greater than that of the heaviest gas giant planets. The finding is reported in a paper published July 3 on arXiv.org. Located some 4,000 light years away from the Earth, CoRoT-20 is a star of spectral type G2V, similar in size and mass to our sun. In 2011, astronomers found a planet orbiting this star on a short-period eccentric orbit. The exoworld, which received designation CoRoT-20 b, is about the size of Jupiter but four times more massive. The exoplanet, classified as a "hot Jupiter," circles its host every 9.24 days at a distance of approximately 0.09 AU from it. Now, a team of researchers led by Javiera Ray of the Geneva Observatory in Switzerland, have found a new substellar object in this system, also on an eccentric orbit, but with a much longer orbital period than that of CoRoT-20 b. The discovery was made as a result of follow-up observations of the CoRoT-20 system conducted between November 2011 and November 2017, using the HARPS and SOPHIE spectrographs. 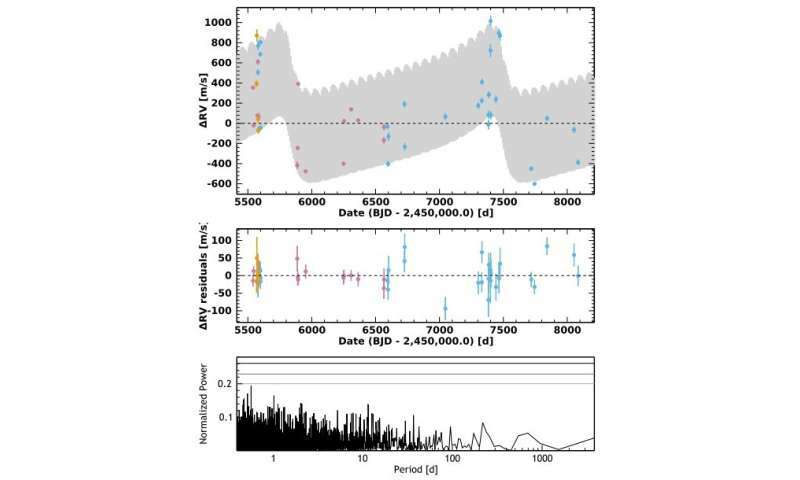 "In this paper, we report a new substellar companion orbiting CoRoT-20, thanks to six years of additional observations obtained with HARPS and SOPHIE spectrographs," the researchers wrote in the paper. Observations carried out by Ray's team show that the newly detected object, designated CoRoT-20 c, has a minimum mass of 17 Jupiter masses. Due to its mass, CoRoT-20 c was initially classified as a brown dwarf. Although the boundary between planet and brown dwarf is poorly defined, astronomers generally agree that brown dwarf are substellar objects at least 13 times more massive than Jupiter. According to the study, CoRoT-20 c is separated from its parent star by approximately 2.9 AU. The planet has an orbital period of 4.59 years and orbital eccentricity of 0.6. Notably, orbital parameters of the newly identified brown dwarf make CoRoT-20 the first known system with an eccentric "hot Jupiter" and an eccentric massive companion. "CoRoT-20 is the first identified system with an eccentric hot Jupiter (e ≥ 0.2) and an eccentric massive companion with a fully probed orbit," the paper reads. The researchers noted that the newly detected brown dwarf interacts with the "hot Jupiter," adding that the currently high eccentricity of CoRoT-20 b is likely entirely due to the presence of CoRoT-20 c.
Due to this interaction, the CoRoT-20 system is perceived by Ray's team as an excellent candidate to test tidal migration models. So far, astronomers have identified at least three migration mechanisms that can explain the existence of close-in "hot Jupiters" on eccentric orbits. Therefore, further observations of CoRoT-20 c, during its next transit, which is expected to occur in late 2020, could help us advance our understanding of these mechanisms. We report the discovery of an additional substellar companion in the CoRoT-20 system based on six years of HARPS and SOPHIE radial velocity follow-up. CoRoT-20 c has a minimum mass of 17 ± 1 MJup and it orbits the host star in 4.59±0.05 years, with an orbital eccentricity of 0.60 ± 0.03. This is the first identified system with an eccentric hot Jupiter and an eccentric massive companion. The discovery of the latter might be an indication of the migration mechanism of the hot Jupiter, via Lidov-Kozai effect. We explore the parameter space to determine which configurations would trigger this type of interactions. Temperature Brown dwarf (& planets) (which do not have their own burning). Star (which have their own burning). Anybody see. the truth of the claim? !! !